OK, this is intended to be a robe à la française, but it’s not precisely what one would call “extensively researched.” I was more going for “pretty”… It looks a little understated, but you have to imagine it made out of a nice brocade or something that would show up when it is colored. I’m not putting it on the doll because the black and white ones look funny on a doll, but that doesn’t mean I’ve decided yet. Some people have suggested a thumbnail with the dress and one with the doll and dress, but where would they go? They would both have to be significantly smaller, or I would have to write a lot more to balance it out. Either way it would look repetitive to me. I prefer having the dress on the doll, but I won’t decide one way or the other until the poll closes. Let’s do a new contest… Thanks to Kelly for the suggestion! I hope whoever wins the contest chooses this one. Very 1700s. My niece colored this pink with every bow a different color of the rainbow. ;) I’ll try May 2. Oh and I have a suggestion for the dress/doll issue: why not every other day you put the doll in the dress and the next you don’t and so on? Then everyone’s happy! Oh, dear, Elle, that argument almost sways me back to doing it the old way -_- I’ll have to think about it… I really like both ways! Wedding anniversary, that’s a tough one. March 20th? The only date I care about is July 27th! Lovely dress by the way. I stand by my vote that you post most of the dresses without the doll. Seeing the dress on the doll just isn’t the same as looking at the dress and imagining what it would look like on a doll. I can see your detail better without the doll and detail is what you do best! I love the colored ones on the doll but i agree it would look funny to have the black and white ones on a doll. This dress is gorgeous. It would be fantastic to see it colored. I think to display the dresses the way you have always done because it is great to see the dresses and immagine who wears them and the situation in Wich that person wears the dress. It makes each dress into a story of its own. Oh and I hope who ever wins chooses this dress I would dearly love to see it colored. awww I was going to go for June the ninth! june 23rd. my little sisters b-day!!! I like the dress without the doll, because it makes it more obvious that these are paper dolls, not just pictures of girls in pretty dresses, if that makes sense. i total agree with you exceptinsects it does make them look like paper doll then girls in dress. august 16th I love how you did the lace! I just had the crappiest day ever so thank you so much for the beautiful dress! 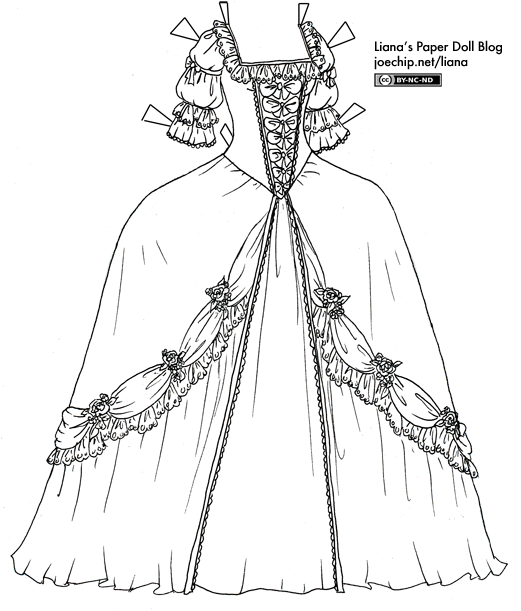 Btw no problem for the idea I just wanted another contest so I can have a chance at that regency gown! Okie dokey! You’re welcome! Just wanted to let you know!